It is imperative that proper test recording is done in a format that is acceptable. By recording test results in this manner, if there is any recourse later on from other people involved with the product or service, then proper documented evidence is available. The above example and the one on the next page, have all assumed the use of data that is normal. So for example turning the steering wheel in a manner that would be used on a daily basis. 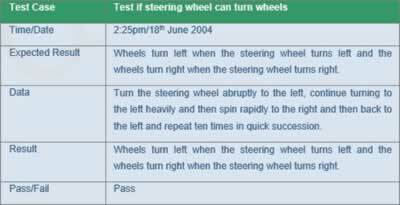 The Test Case below, uses data which is bad data, as this would not be the expected behaviour of the person using the steering wheel on a daily basis. But what happens if the vehicle is going to be used off road or for rallying? Then the violent turning of the steering wheel may be a commonplace in such a situation. In the next test case the extreme is used that is ugly data. Here what is least expected in the daily driving habit of a typical car driver is done, that is driving at high speed in reverse and turning the steering wheel abruptly from one side to the other.  It is very important to record tests in a manner that is accountable to all those involved with the product.  By knowing what the outcome should be (expected result) it can be determined whether a test has passed or failed.  The expected result should be positive and any deviation will be a failure.  Test cases should include bad and ugly data as well as good data.